Kingdom Housing had submitted an application to develop on land to the north of Nairn Street in Kirkcaldy. The 152 homes would be made up of six four-storey flats, several three-story flats, two two-storey flats and a mix of two-storey houses, with 257 parking spaces and open green space. But the application was recommended for refusal at the Central Area planning committee on Monday afternoon. Planning officers felt the level of noise impact from a major local factory would be too high within the properties. 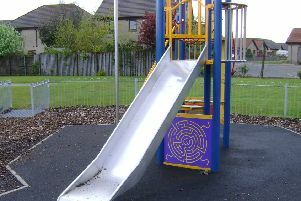 Concerns were also raised that the minimum garden ground space was not met – and they considered the site overdeveloped. Nine objections were also lodged, which included concerns over levels of traffic which were already dense, a lack of privacy for properties already in the area due, and concerns about the pressure the new development would have on local schools. Planning officer Natasha Cockburn told the committee: “Even with the proposed 3m acrostic barrier, the windows would need to remain closed to reach the acceptable noise levels. “Forbo Flooring factory is also not currently operating at full capacity. If it wase to decide to do that, acceptable noise levels couldn’t be reached. However, Councillor John Beare raised concerns that refusal would lead to an appeal. All councillors agreed to refuse the application.